On the day of her last college final, Cass Weatherfield tries to stop a tragedy and ends up killing her classmate instead. Five years later, she’s living in San Francisco and struggling to keep her telekinetic and telepathic powers in check. Her carefully constructed life falls apart the minute her ex steps back into her life. Shane’s sister Mia has gone missing, and he needs Cass’s help to find her. Returning to New Orleans is the last thing Cass wants to do, but she agrees. Opening herself up to the full strength of her powers is hard enough. Resisting the pull Shane has on her is damn near impossible. Sigh. 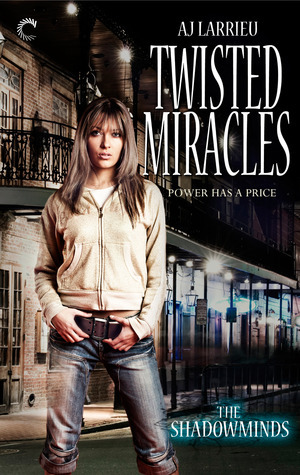 So many things to love about Twisted Miracles. The worldbuilding is rich and detailed without slowing the story’s pace. There are different kinds of Shadowminds: all of them have telekinesis and telepathy as skills, but some are healers. Some can function as a GPS tracking device, pinpointing a person’s location with frightening accuracy. And some are pullers, Shadowminds who pull energy from their environment. Cass is a puller. Her ability is so rare no one in the New Orleans Shadowmind community knew what she was, so no one believed her when she said she’d killed her classmate. Learning that she isn’t crazy is a relief, but figuring out how to control her deadly power is frustrating and she tries to give up more than once. Mastering it is safest for everyone around her, though; if she fails, she could end up killing someone again. But let’s move on to the really important part: Cass and Shane. Hoo-boy do they have chemistry. I mean, they have chemistry. Their rekindled relationship isn’t smooth sailing. Cass is determined to return to her life in San Francisco and Shane refuses to get involved with her knowing he’s only going to get his heart broken again. But at the heart of this couple is a friendship that became more, and the two of them have a rhythm you can only find with someone who knows you inside and out. Their moments together are sometimes sweet, sometimes angsty, and that one in the tent? Scorching. As Shadowminds, they have the ability to be inside another person’s head, to feel what they’re feeling. It’s never done without permission, so when they allow the other person in? I’ll never look at camping the same way again. The biggest downside to Twisted Miracles, though, was the setting. Yes, it’s set in New Orleans, but it felt like it could have been set anywhere. I wished there’d been more of the uniqueness of NOLA woven into the story. It’s such a vibrant, quirky city, and that was missing here. I gulped down Twisted Miracles and now I’m sitting here with grabby hands, waiting for the next book. Because more Shadowminds means more Cass and Shane, and the world definitely needs more Cass and Shane. This sounds good, I’ll have to check it out. I bought this book and the novella based on this review. I would give it maybe a 3 and that is being generous. I couldn’t feel the connection between Shane and Cass. For me they were 2 friends who fell into a sexual relationship rather than having a grand passion. As for the story it’s self, the bad guy was sign posted fairly early in the story. I also thought the world building was light but perhaps that will be developed in subsequent books. It was an enjoyable quick fluffy read. As it’s the first in a series I’d probably read the second to see if/how the author develops the world building and the characters.